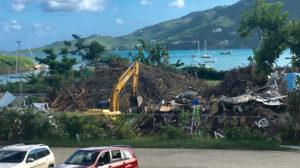 Farmers and gardeners on St. John and St. Thomas can now pick up natural vegetative debris that has been processed into small chips and can be used as mulch, and plans are underway to set up a similar pickup on St. Croix, according to Agriculture Commissioner Carlos Robles. On St. John, the Department of Public Works will allow the public to pick up the material from the Susannaberg Transfer Station by the truckload or bagful. There is no charge. Derron Jordan, assistant director of operations on St. John for DPW, said anyone wanting small amounts of mulch can come to Susannaberg and fill up a bagful from a pile left outside the inner gate at the transfer station. That inner gate separates the storm debris collected by Ceres, the contractor selected by the U.S. Army Corps of Engineers, from regular household waste being stored at the site. 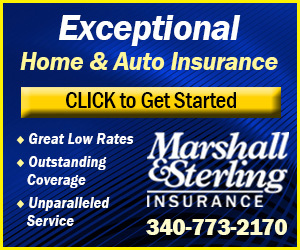 Farmers, contractors, or anyone wanting the mulch by the truckload can call Jordan at 340-626-1877 to arrange for pickup between 9 a.m. and 2 p.m. Monday through Friday, and from 8 a.m. to noon on weekends. Jordan said he is short staffed but will do his best to provide personnel to operate a loader to transport the mulch into trucks for the public. Those picking up the mulch must provide their own vehicle, wear appropriate safety gear, and sign a liability waiver, Jordan said. The liability waiver is necessary because the mulch might contain termites that can spread, or pose a fire hazard if it’s not properly managed, according to Josephine Roller, owner of the Coral Bay Garden Center, who received her first truckload on Wednesday. On St. Thomas, farmers at Bordeaux are already receiving truckloads of mulch, which is being stored at the field near the Cancryn School, according to Robles. “One of my staff is out there [using] one of my trucks,” he said. Farmers on St. Thomas also must sign a liability waiver. Robles said other sites are being considered for mulch distribution. 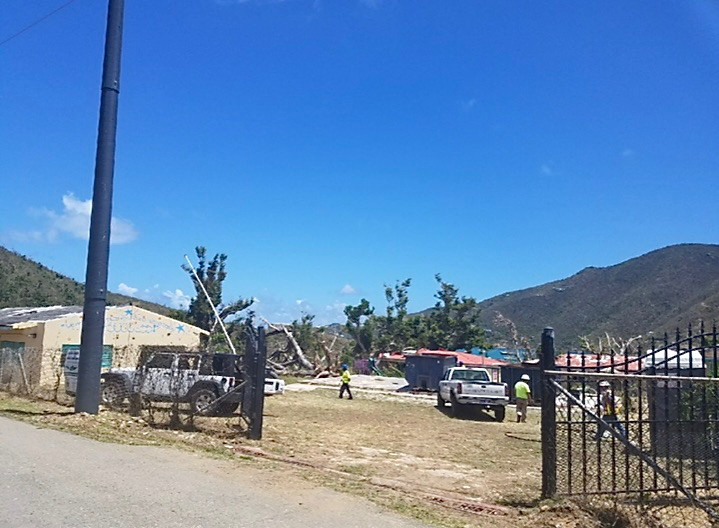 The public will not be allowed to bring their vehicles to the temporary debris storage site at Cancryn, according to Robles, although the Source did receive unconfirmed reports that a pile of mulch outside the gates is being made available to those who want to pick up only a bagful. 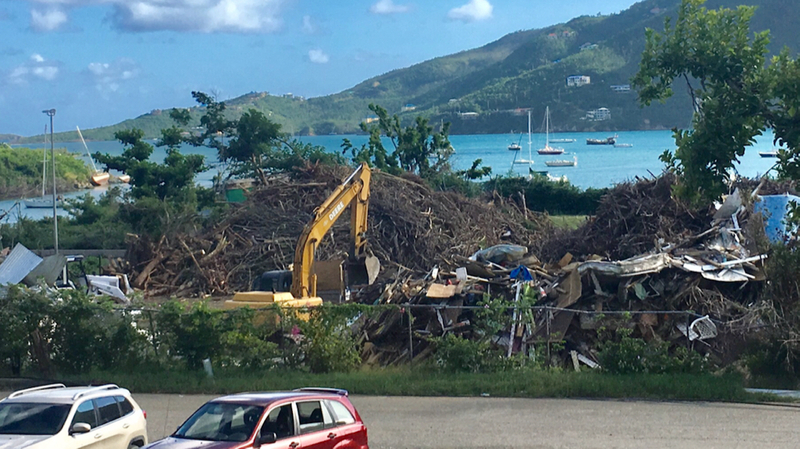 On St. Croix, the vegetative storm debris, also known as “green waste,” is being stored in Estate Body Slob and has not yet been chipped. Robles said a contract to bring in a company to do the chipping is underway. 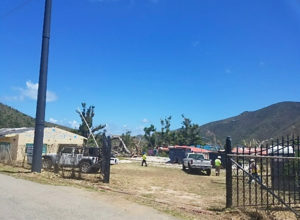 On St. John, the Coral Bay ballfield where the green waste and other storm debris had been temporarily stored is now completely clear, according to Steve DeBlasio of the Bloomberg Group. “The field is looking beautiful. They really cleaned it up. Ceres is doing it under the direction of the Army Corps, and FEMA is paying for it,” DeBlasio said. The agreement to use the field, which is owned by the Moravian Church, called for the field to be restored to its prior condition or better. The territory’s estimated 750,000 cubic yards of vegetative storm debris has been a source of controversy since September when Hurricanes Irma and Maria slammed into the islands. Mapp requested that the Army Corps burn the debris, but public opposition in November led the Senate to pass legislation to “ban the burn.” The governor vetoed the legislation, but his veto was overridden. Since then, the governor has decreed that all storm-related debris be transported off island. The distribution of mulch indicates a change in policy. After months of pleading, Roller welcomed the delivery of 50 cubic yards of mulch that arrived this week on her 17-acre farm. The delivery was arranged by a St. John community organization. Roller said she is still disappointed that the total amount of processed green waste on St. John was not delivered to her 17-acre farm, which grows plants, trees, and organic vegetables marketed as “Josephine’s Greens.” Roller said she has the equipment and technical expertise to convert the chipped wood into compost. “You have to irrigate it 12 hours a day and add nitrogen for four month,” she said. Through composting, the amount of material is decreased between 30 and 50 percent. Roller said in past years Asplundh, the company that had the contract to cut down branches to keep utility wires clear, donated their processed green waste to her farm. This year, because the storm took down so many trees, and utility lines have already been cleared, she can’t count on that source for building up her compost pile.